Do yourself a favor and be sure to scroll all the way down this page, taking note of all the information available here. Here we've added some information on various subjects that seem to constantly be in doubt. Questions about these things seem to resurface regularly. We try to help by showing it all. This link [just below] will take you to a site for dog breed info. It should open on the Patterdale Terrier page. On that page is one of the very best and most honest description of these dogs that we've ever found. Please Read it carefully. Whoever wrote it knows what they're talking about. Note: That's just the Patterdale Terrier section of that web site which covers many breeds. Wikipedia finally put together a decent description of the Patterdale Terrier. "Patterdale Terrier puppies tend to be bold and confident beyond their capabilities The Patterdale Terrier is known as a working terrier, rather than a show dog. Typical of terriers, whose work requires high energy and a strong drive to pursue prey, Patterdale Terriers are very energetic and can be difficult to socialize. Though also kept as pets, due to being bred for high-intensity work, they may tend towards being too energetic for a sedentary household life and run round like mad in the household." Think on this BEFORE getting a puppy. 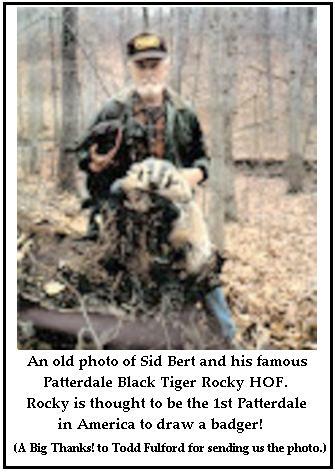 Colors & Markings <<< Click on this page to see some of the colors for Patterdale Terriers. Black and Chocolate are more common and popular but not the only color-scheme in the gene-pool. Always remember, it's NOT their color that makes them Patterdale Terriers. So, what are you getting yourself into ?!? Click on these links for some realistic looks into the realities of it all. Their seems to be a growing interest in getting the Patterdale Terrier for the purpose of going after groundhogs. I personally think this is lunacy but others claim to think of it as fun. To each his own, I suppose. In any case, everyone should understand a specific hazard that your dog is more likely to face with groundhogs than with any other beast commonly found in the ground. Here is a 4-page essay (PDF) to help explain it. Check back regularly 'cause there's more coming all the time. Here are a couple youTube videos showing some real-life reality for earthworking dogs. I don't know these guys and hope they don't mind my showing the links to their video here. Click these links (below) for a look at what earth-working is all about! This one shows how dogs look if they (and their owners) go in for the "earth-working" games. This one shows a really elaborate training setup. This one is one of the most elaborate training setups I've ever seen! You can believe that if you build it, "they will come!" Have a look. If you take the time to view these videos, pay close attention to the size and structure of these "European type" dogs. They're not at all like the dainty little things the Americans seem to prefer. Now for something that's both different and special! Ratting with Rat Terriers! This is a YouTube video of J.Reed (and company) doing the ratting thing the way it ought to be done! This is a fun and effective method for reducing a local rat population quickly. Enjoy! Here is a link to a forum where they're discussing the idea of whether or not a Patterdale Terrier would be victorious in mortal combat with the Scottish Wild Cat, (a somewhat larger and thoroughly undomesticated version of the common house cat.) The discussion that follows (from forum members) is thought-provoking and the description given for the Patterdale Terrier is one of the best I've ever seen. Have a look. For a brief look at the real thing look here>>> Reports from the Field! This page is in a constant state of change as information comes trickling in. If YOU have a good action story to share (hopefully with a photo or 2,) we'll be happy to show it here. Click here>>> Breedings & Bloodlines & Pedigrees As We Know Them. This is where we display what we know about how our dogs are bred (and some others). You might find this page to be informative.